TV chefs can often be seen wielding their sharpening steels around like a samurai sword, but away from the cameras there are far kinder and less dramatic ways to hone or sharpen your chefs knife. After all, even the finest knives in the world are practically useless with a dull edge. So what’s the best technique? How blunt is your knife? Does it need sharpening, reshaping or honing? Each of these needs has a solution, using the right tools and techniques. Asides from keeping your knives in prime condition, sharpening will reduce effort and increase safety in the kitchen. When preparing for a long, busy service, blunt knives are probably the last thing you need! When using knives, either for chopping or sharpening, help avoid accidents by making sure you have suitable lighting installed. LED bulbs, for example are best for task lighting, giving you directional light as opposed to the dim glow of old incandescent light bulbs. In most commercial kitchens grid lighting is installed, but if you are sharpening at home then use your kitchen spotlights or LEDs to illuminate your business. When sharpening with a steel, you'll also need a damp cloth or tea towel to stop it from slipping. Save your fingers from the peril of a slipped blade, as avocado casualties will confirm. One of the most important elements when it comes to sharpening a knife is the angle, but which is best? There is a balance between sharpness and how long the knife will stay in prime condition once sharpened. A lower sharpening angle is better suited to Asian-style knives, as they tend to be kept sharper to cut through softer food. On the other hand, Western-style knives are sharpened to around 20 degrees which also means that the cutting edge tends to last longer. This article will show you how best to sharpen and hone your chefs knives to perfection. 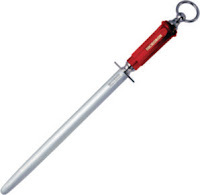 Sharpening steels can be used for regular honing or to restore a completely blunt knife. Ceramic steels will help you achieve a fine edge to your blade, whereas diamond steels are highly abrasive, enough to bring back a knife that is completely dull. 5. Repeat steps 3 & 4 at least five times, and up to ten times for maximum sharpness. It is essential to maintain a sharpening angle of 15-20 degrees and run the full length of the cutting edge along the steel form the hilt to the tip of the knife. Sharpening stones or Whetstones are widely considered the best way to sharpen a knife, especially Japanese chefs knives, which are generally able to be sharpened to a finer cutting edge because of the harder steel used in their production. Sharpening with a whetstone also replicates the finishing process used back at the factory, but also requires the correct technique. When choosing the grit of your whetstone, bear in mind that the higher the grit, the sharper the edge, but also the more strokes required. At the 100-250 grit level, whetstones can reshape blunt knifes and should really only be used for this purpose. At the steep end, 6000-8000 grit stones give the finest possible finish to your blade, if you’re looking for the ultimate sharpness. Whetstone sharpening techniques are different depending on the style of knife. For detailed instructions on these techniques refer to our handy infographic. 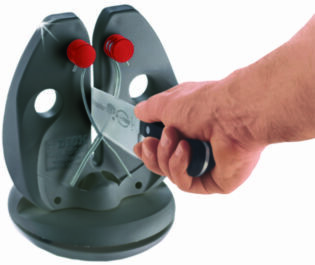 If time is not on your side, or you’re not so confident with the whetstone or sharpening steel techniques then manual & electric knife sharpeners are perfect for your needs. These are not only safe to use, often including a stand and finger holes for support, but also produce results in seconds, perfect when service is just minutes away. Some of these devices have a couple of slots: one for sharpening and one for honing so are optimised for both requirements. In some cases, the sharpening element can also be detached so that it can be washed separately. Which sharpening technique do you prefer? Let us know your thoughts in the comments section below.